The Wimbledon Way is a heritage walk taking you from Wimbledon town centre through Wimbledon Village and on to The All England Lawn Tennis Club and Tennis Museum. 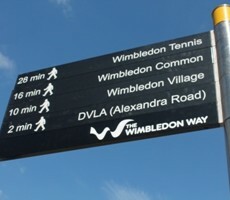 Everyone walking the 2.012km route will literally walk through some of Wimbledon’s fascinating heritage and culture. The vision for The Wimbledon Way emerged through Merton Chamber of Commerce’s consultation with the business community and other stakeholders on how Wimbledon should celebrate the Olympics and make the most of the opportunity. Our discussions centred on something that would provide a sustainable all year round attraction for both regular users and visitors to the town centre and the village. In developing the idea we have brought people together around a common interest and their enthusiasm and input has resulted in a unifying project for business and the community embracing our heritage, the arts and tennis – we also want to mark and celebrate our long association with the world renowned Wimbledon Championships. Our ambition is that all parts of the Wimbledon community will become involved in the foundation and development of The Wimbledon Way. As well as physically linking different parts of Wimbledon, we hope it will bring together different people and organisations from the community in a celebration of everything that is special about our area. Andrew Wakefield, Chair of Merton Chamber of Commerce until 2016.